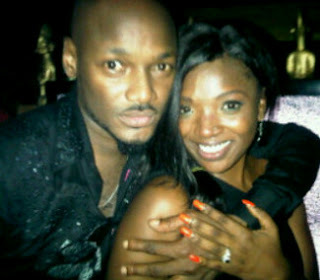 2face Idibia and Annie Macauley just took their relationship several notches higher. The pop icon who’s had an off-and-on relationship with Annie for over a decade, surprised us all tonight when he popped the question, during an outing at Club 10, in Lagos. We’re told Ms Macauley’s close friends were in on the plan, but the actress was completely in the dark. 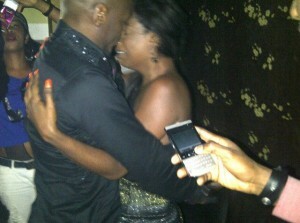 Little surprise she broke down and wept when Idibia proposed. On Twitter and BlackBerry Messenger, friends are congratulating the pair, with one particular insider saying ‘it’s about time’. Dancer Kaffy tweeted the picture above, with the text ’2baba proposes to Annie!!! woooooooo live at Club 10′. No further details for now. Annie Uwana Macauley has a daughther (Isabella) for 2face. But before now, she was, in many people’s eyes, just another baby mama. Sunmbo Ajaba and Pero Adeniyi also have children for the musician – two each. And Pero, who’s now based in the US, is due to deliver her third Idibia baby in March.